The team at an award-winning Stockport-based home care company are putting their needles together to help the elderly keep warm this winter. Caregivers from Home Instead Senior Care on the Europa Business Park in Cheadle Heath are supporting the Age UK Innocent Smoothie’s Big Knit campaign. The Big Knit 2011 asks people to knit little woolly hats that will sit on Innocent smoothie bottles from 16th to 30th November. For each be-hatted smoothie sold, Innocent will give 25p to Age UK’s Spread the Warmth campaign. And it’s not just care workers who are knitting – their older clients are also joining in the fun not to mention other members of staff. Home Instead Senior Care has pledged to knit 1,000 of the mini woolly hats for the campaign which raises money for Age UK Stockport. The campaign is annual and this year innocent is aiming to raise £200,000 to help Age UK make winter warmer for thousands of older people across the UK. The bad weather cold days and long dark nights of winter often lead to increased social isolation, illness and loneliness for older people. Physical warmth, in the way of clothing, electric blankets and warm food. Combat isolation and loneliness by bringing older people together with people in their community through everyday activities, such as knitting. 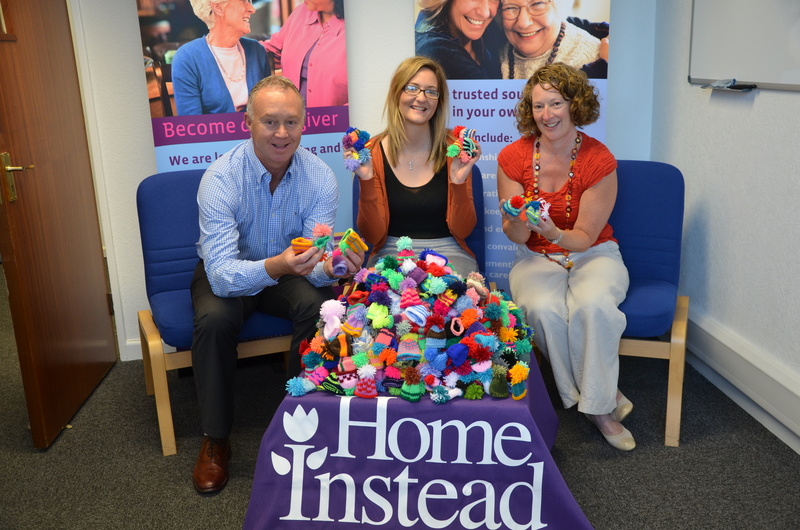 Home Instead staff are pictured with Lucie Newsam from Age UK Stockport, surrounded by some of the colourful mini hats knitted by Home Instead. David and Joanna, who run the Stockport office of Home Instead Senior Care, have also enlisted the help of family to reach their ambitious target of knitting 1000 little woolly hats. Their daughter, who is currently in full time education at university, has been producing mini pom-poms as decorative features to add to the little woolly hats. The fashion-conscious smoothies can be found in the chillers at Sainsbury’s from November, with a donation of 25p for each bottle sold from Innocent and Sainsbury’s going towards Age UK.